How do I know my loved one will receive the best of care at Vienna? Does Medicare cover a resident’s stay at Vienna? What services are covered in Vienna’s base rate? Are residents able to make choices about their daily routine, such as when to go to bed and what to eat? When can we visit? Can we take our loved one on an outing? Are residents offered choices of food at mealtimes? What activities can residents choose from? Do Vienna’s activities include religious services? Can residents have personal articles and furniture in their rooms? What types of clothing and personal grooming items does my loved one need? How does Vienna ensure the health and safety of its residents? Do you encourage resident participation? Where I can I go for more information? Vienna provides 24/7 licensed nursing coverage. Physicians visit monthly, and remain on call. We also have an in-house audiologist and dental care as needed. Our dedicated team of professionals oversees the needs of our residents, and we take great pride in offering the highest level of care. You’re invited to visit us anytime to tour our facility, and meet our administrator and staff. Vienna Nursing and Rehabilitation Center is licensed and certified by Medicare and Medi-Cal as well as the California Department of Public Health. Vienna Nursing and Rehabilitation Center is locally owned and operated, which ensures that owners consistently oversee the health of our residents and daily operations. Vienna meets the extensive standards prescribed in state licensing laws and federal Medicare/Medicaid certification requirements, and state inspectors conduct annual compliance visits. The Medicare Program (Part A — Basic Hospital Insurance) helps provide those who qualify up to 100 days of skilled nursing care per benefit period at Vienna, which is a certified skilled nursing facility. To qualify for this Medicare benefit, patients must be admitted with a physician’s order within 30 days of three consecutive nights at an acute care hospital, and need skilled care such as rehabilitation or licensed nursing care. The Medicare card for the patient must say “Medical Insurance.” Generally, Medicare will pay 100% of the first 20 days of care. A daily co-insurance of $128 is required for days 21-100. Medicare does not cover custodial long-term care services. If needed, we can assist you in completing the Medi-Cal process or direct you to county assistance. Do you offer both inpatient and outpatient rehabilitation services? Yes. Vienna provides individualized therapy, both on an inpatient basis (6 days per week) and outpatient basis (5 days per week), using the latest equipment in our expansive free-standing rehabilitation clinic opened in December 2011. The clinic offers high quality continuity of care for those transitioning from inpatient to outpatient status, allowing them to rely on therapists familiar with their care. Programs are supervised by licensed physical, occupational and speech therapists. Short-term rehab patients enjoy a separate residential wing with a dining and computer room. Absolutely. We pride ourselves in assessing usual daily life patterns, and do our best to provide routines that are as close to “home-like” as possible. We want our residents to maintain their sense of choice. Vienna has flexible visiting hours. We prefer you call our nursing staff if you plan to visit after 8 p.m. Your loved ones can accompany you on an outing; we will need their physician’s approval that they can leave the facility. We offer a number of fine dining choices, including therapeutic and vegetarian diets. 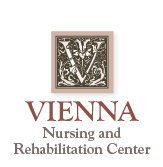 Vienna offers a diverse activities program that includes pipe organ concerts, Bingo, holiday parties, summer BBQs and ice cream socials. Residents may also participate in classes such as cooking and yoga, and certified pet therapy programs. We provide evening activities at least weekly, including candle light dinners, entertainment, and resident gatherings. Our residents enjoy outings to movies, the Lodi Grape Festival, restaurants, community performances, and an annual BBQ at Lodi Lake. See a sample activity calendar here (PDF). Many different church denominations provide weekly religious services at Vienna Nursing & Rehabilitation Center. Diverse activities and social services consider our residents’ religion and culture. We encourage families to bring personal items such as photographs to create a home-like environment beyond the furnishings that Vienna provides. Please contact our administrators who can help you consider additional items, given space and regulatory requirements. We can provide you with a list of recommended clothing, but as a general rule, plan on five changes of clothing and rubber-soled shoes. You will want to leave valuable personal items at home. Vienna provides 24/7 licensed nursing coverage. Our residents’ personal physicians visit every 30 days, and our nurses have 24-hour access to these doctors and on-call physicians. Our facility is well-lit and uncluttered. All hallways have handrails, and restrooms are equipped with grab bars. Spills are cleaned up quickly. We offer the Wander Guard wrist alarm system for those who have a history of wandering. Our staff is trained to evacuate residents in case of emergency. Vienna has a Resident Advisory Council that meets regularly to discuss daily living concerns, including monthly activities. All concerns are brought to the appropriate department heads for resolution. Residents who live with us are encouraged to participate, increasing their sense of community. Statewide Medicare survey of nursing homes Please note: Industry leaders agree that there are several aspects of nursing facilities that this survey does not consider in its rating system. We invite you to contact our management to review and discuss these ratings.